Thanks for registering for Silicon Beach Fest 2015. You can pick up your conference pass at the Marina Del Rey Hotel on June 25, 9a-6p and June 26, 9a-5p, with your ID. Passes will not be mailed. August 24 - 27, 2016! Silicon Beach Fest is LA’s original festival celebrating LA tech, entertainment & startups with panels, keynotes, workshops, mixers, and more August 24-27, 2016 in LA. We are excited to celebrate our 5th year, adding an extra day of panels for three days of panels Aug 24-26. 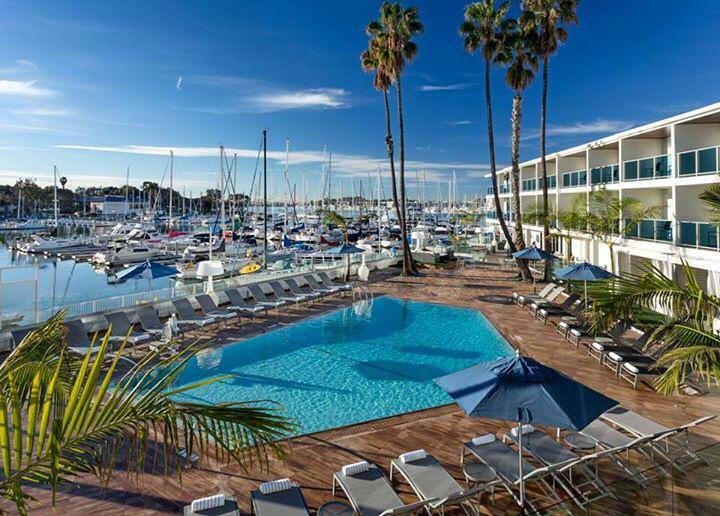 We are returning to the stunning Marina Del Rey Hotel, which had a $25M renovation, with gorgeous views of the marina, water and boats from every conference room. SBF 2016 Highlights include: keynotes with top tech leaders, panels, hands-on workshops, and more. Plus multiple networking parties and mixers, and a VIP yacht cruise. Attend pre-events to celebrate all week: Monday Aug 22 is Downtown Fashion Tech day, and Tuesday Aug 23 is Playa Vista Open House day. Attendees include startup CEOs, accelerators, VCs, investors, Hollywood execs, agencies, content creators, social media gurus, developers, designers, virtual reality experts, and more from LA, Silicon Valley, OC, San Diego, New York, and international. Join us at the marina this summer to celebrate LA's digital innovators in tech, startups, entertainment, marketing, and more! - Startup Showcase: Meet 20 up-and-coming Silicon Beach startups who'll pitch for their chance to win the grand prize and SBF 2016 - Startup Showcase title and prize package including $5K cash provided by Media Temple, a Surf Air round trip ticket on Surf Air to its California destinations, a Air New Zealand round trip flight LAX to London. Semi-Finals on Wed Aug 24, 4-6p and Thur Aug 25, 4-5p; Finals Fri Aug 26, 5-6p. - VR Lounge: Try the latest in Virtual Reality and Augmented Reality, with vendors including AT&T Entertainment's DIRECTV, 360Rize, Specular Theory and more, Thurs Aug 25 and Fri Aug 26. - Beach Games: Surf, play basketball, beach volleyball or ride bikes at our beach games on Sat August 27. We're the only tech fest that includes beach games to network with friends you've made during the fest! - Sunday Funday Pool Party: Chill and lounge poolside on Sunday August 28 with your new friends from the fest! - Sponsor Tables: Promote your product at sponsor tables in the lounge (indoor) or on the lawn (outdoor) on August 24, 25 or 26. - LA City Opening: LA City Office of LA Mayor Eric Garcetti discuss how LA City helps LA Tech, 5-7p @ Cross Campus Downtown LA, with fireside chat with Jason Nazar, CEO of Comparably. - Playa Vista Open House. Playa Vista has been getting national attention with several large tech companies moving to the area. Now it's time for you to meet them. Visit several Playa Vista companies offering Open House receptions for Silicon Beach Fest attendees. If you'd like to host an open house for SBF attendees at your Playa Vista offices (you provide beverages and appetizers for 50-150 attendees for 2 hours within 10a-8p), email info@digitalla.net with SBF OPEN HOUSE as subject. - Women's Lunch: CTRL Collective hosts the Women's Lunch (12-2p). Open to SBF passholders. - Startup Showcase 1: See new Silicon Beach startups at the Startup Showcase Semi-Finals 4-6p, featuring more than 25 startups pitching, including winners of Digital LA and other local startup pitch competitions. - Panel tracks 10a-6p include: LA Tech, Advertising/Marketing, etc. - Startup Showcase 2: See new Silicon Beach startups at the Startup Showcase Semi-Finals 4-5p, featuring more than 25 startups pitching, including winners of Digital LA and other local startup pitch competitions. - Startup Showcase Finals are 5-6p. Finalists will pitch for the SBF 2016 title and prizes! - VIP Yacht Cruise: Paid VIP passes, select speakers and sponsors are invited to this three-hour FantaSea yacht cruise 6-9p, including one hour dock, and two hours sailing. - Play beach volleyball, beach basketball, surfing lessons, and more with your fest friends. Details soon. The detailed conference agenda and panels will be posted soon at http://siliconbeachfest.com, with updates daily. If you'd like to sponsor any of these specific parties or events, email info@digitalla.net with SPONSOR as the subject. - Includes badge allowing admission to most panels and parties. Some sessions may require separate registration or a VIP pass. Does NOT include: Parking, food, or drink. Parties are cash bar unless otherwise indicated. Some events may have complimentary snacks or beverages. FOOD: Lunches and dinners are not included with Silicon Beach Fest. Light breakfast and coffee will be available. Watch for food trucks. Complimentary snacks are available from in-kind sponsors and more (please tweet thanks!). Cash bar at most events unless otherwise indicated. Some venues are 21+ only and require a photo ID. If you'd like to provide in-kind food, email info@digitalla.net with INKIND as subject. - Free public lot approximately 15-20 minutes walk from the hotel at Dock 52, 13501 Fiji Way. SBF does not cover parking or parking tickets. WIFI: Marina Del Rey Hotel has free wifi, as do most venues. Look for the wifi password on on the back of your nametag. CHARGING STATIONS: Bring your own USB charging cord, or use the charging stations. SBF DISCOUNTS: Dozens of Silicon Beach apps and other companies are offering discounts, which will be listed soon. If you'd like to offer a discount for your app, etc. email info@digitalla.net with DISCOUNT as the subject. Silicon Beach Fest registration is not refundable. All sales are final. SPONSOR: Sponsor Silicon Beach Fest overall, or a track or a party to increase your company visibility and branding among LA's startup entertainment community. Sponsorship starts at $2.5K, $5K, $10K, $20K and up. Email info@digitalla.net with SPONSOR as subject so we can send you the SBF sponsor deck. IN-KIND SPONSORS: If you can provide free product (food, drink, other services), we will add your logo to our in-kind sponsor page. Email info@digitalla.net with INKIND as subject. TABLES: Tables are available at the Sponsor Lounge at the Marina Del Rey Hotel on August 24, 25 and 26. Register above and send a follow up email to info@digitalla.net with TABLE as the subject, and we will foward you to our logistics team for load in details. PRESS: Press registration will be available by August 1. Our previous SBFests have been covered or mentioned by local and national press including Forbes, New York Times, LA Times, LA Business Journal, Pando Daily, Huffington Post, and more. - Kluge Interactive for design and branding Silicon Beach Fest. @HeyKluge. - Media Temple for hosting the Silicon Beach Fest site and Digital LA site. @MediaTemple. ABOUT SBF: Silicon Beach Fest is created by Digital LA. The Silicon Beach Fest board consists of leaders from LA's tech scene, who help organize tracks and panels. Silicon Beach Fest takes places as a multiday event in the summer, and a one-day event in Hollywood or another part of LA in the fall. Last summer's Silicon Beach Fest attracted more than 2,000 attendees who attended main and related events that week. Silicon Beach Fest has been covered in Forbes, New York Times, LA Times, LA Business Journal, Pando Daily, and more. Digital LA is the largest digital networking group based in LA, reaching more than 80,000 professionals weekly via its newsletter and social media. Digital LA organizes weekly panels and mixers for digital professionals, including startup CEOs, VCs and investors, entertainment including Hollywood movie and TV studios, music labels, agencies, video games, VFX, social media, digital advertising, developers, designers, marketing and and more. Digital LA is the founder of Silicon Beach Fest, the original and largest multi-day startup / entertainment conference. Follow @DigitalLA. Digital LA has been recognized by Forbes and the LA Times as keeping LA's tech community together via its fun and friendly events.